MULTIPLE OFFERS ~ SOLD OVER LIST PRICE! Country living awaits with this dynamic 4.85-acre property in the heart of Graham! 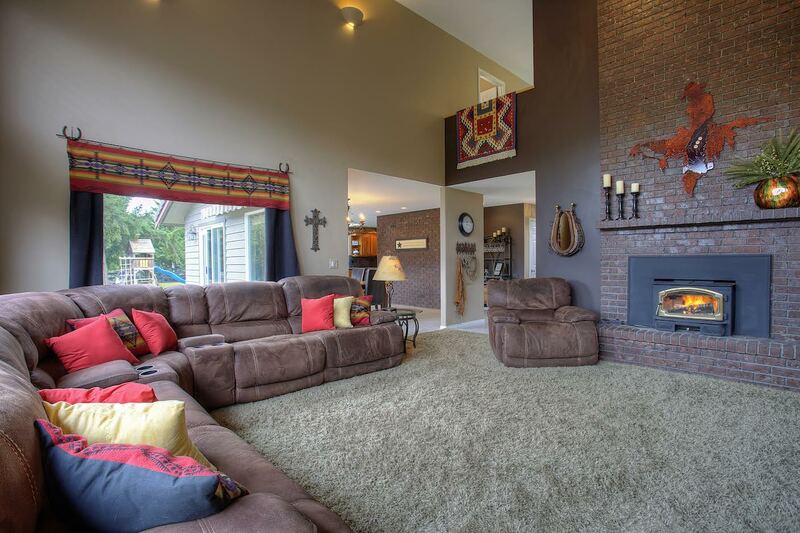 Not only does this incredible property feature a stunning 2004-built home, but you’ll also find a 90’ x 120’ arena, a run-in shed, feed storage, a 2-level goat house, a dog kennel/run, and fabulous space to spread out on and enjoy! Additionally, the main home features 4 bedrooms and 2.5 baths, promising ample indoor space to take advantage of as well. 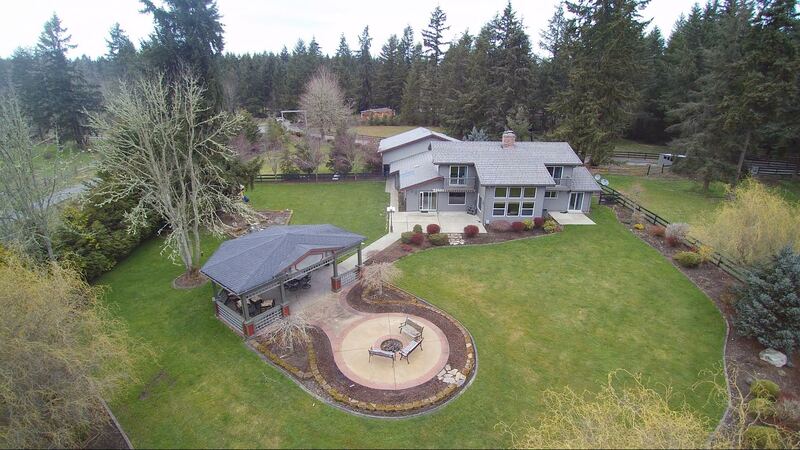 Located at 9309 262nd St E Graham WA 98338, this country treasure is listed for $437,500. Tucked away in a storybook setting surrounded by tall trees and conveniently fully fenced, this home-sweet-home offers you the opportunity to live in a Pacific Northwest oasis! 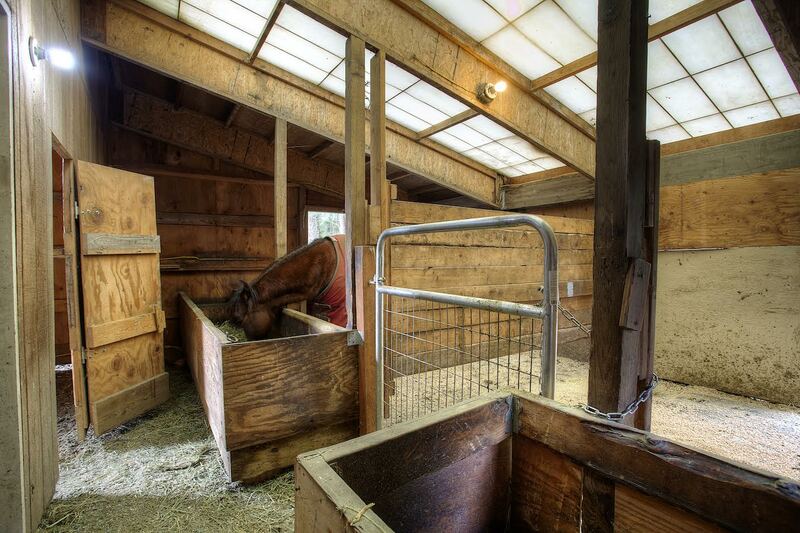 For those who dream of raising horses, goats, chickens, and other animals, this home is equipped with everything you’ll need. From the run-in shed and 90’ x 120’ arena to a 2-level goat house and feed storage area, this property is alive with potential! Plus, a dog kennel/run ensures you can keep your canine pals happy, too. 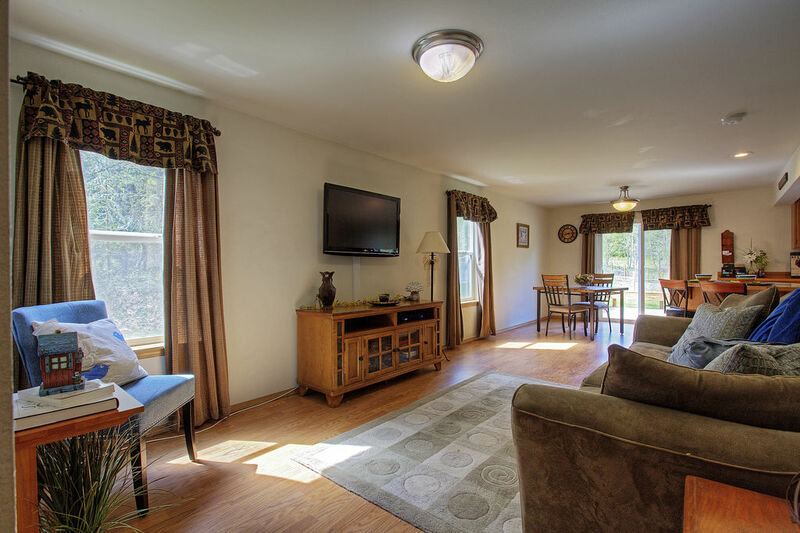 In addition to top-notch amenities for animals, this lovely property is ready for entertaining! The expansive lush lawn is ready for play, whether you’re tossing around a football or practicing hitting home runs. A huge deck overlooks the idyllic scene, and a fire pit is ready for roasting s’mores while the sun goes down! 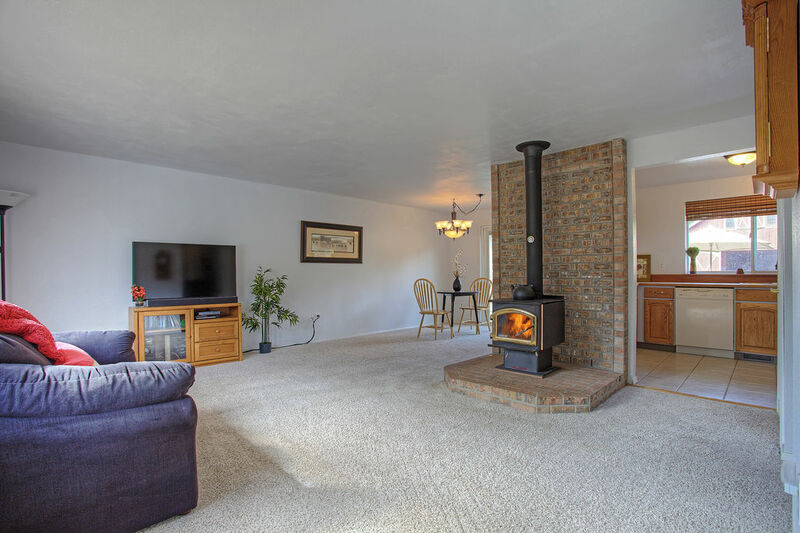 After a day of tending to your livestock and taking in the fresh air, this home’s indoor offerings provide a warm and welcoming setting to indulge in. The 2-story entryway makes for a lasting impression, and immediately to the right you’ll find an entertainer’s haven. Natural sunlight pours in through a large window in the formal living room, made all the more sophisticated with its stately fireplace. Newer flooring flows right into the formal dining room, a space that has enough room to host a crowd for holiday feasts and special occasions! 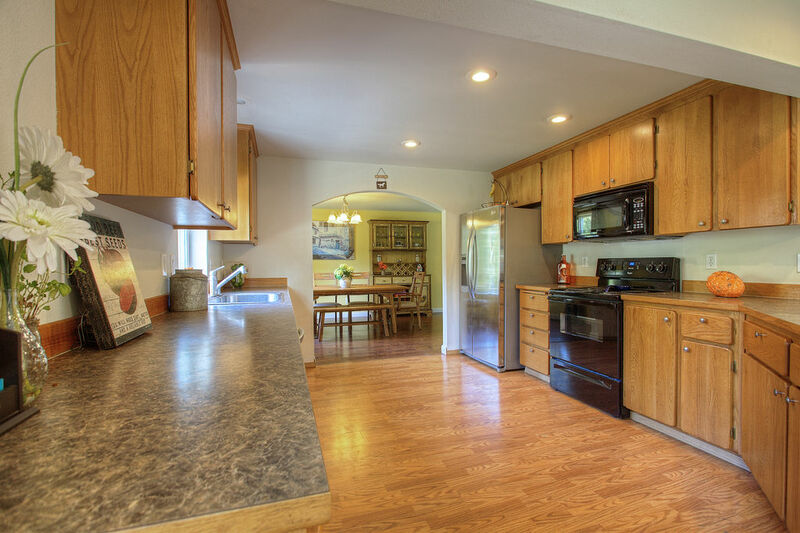 An archway leads to the huge kitchen and dining nook, and this spacious center is ready for it all, whether you’re whipping up an elaborate home-cooked meal or baking dozens and dozens of holiday cookies! 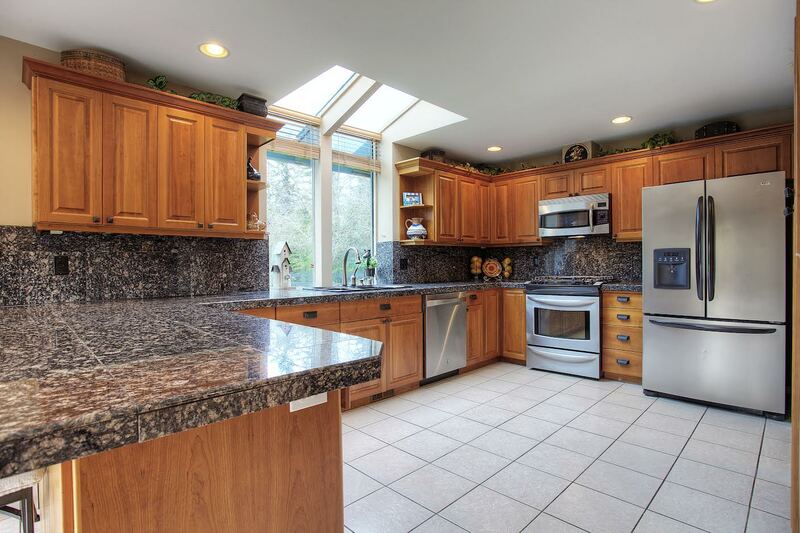 Ample counters rest alongside generous cabinetry, promising you plenty of room for storing kitchen essentials. Laid-back dining options await at counter seating and in the dining nook, and the living area shows off the perfect place for casual movie nights snuggled up on the sofa! This home’s 4 bedrooms offer versatility, whether you use each one as a bedroom or transform one space into a fitness center or hobby room. The master suite presents an especially comfortable sanctuary, with its built-in window bench seat, walk-in closet, and ensuite bath! At 9309 262nd St E Graham WA 98338, you’re just a 5-minute drive to Meridian, making it easy to get around the rest of Graham and beyond. Enjoy being in a location that feels miles away from it all while still being just minutes to schools, shopping, restaurants, and more. 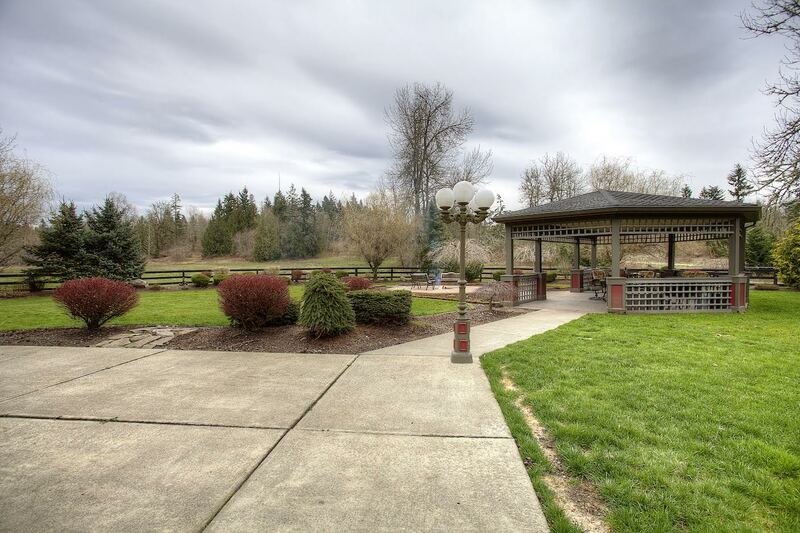 Just 9 minutes from home at Meridian and 224th St E, you’ll find several options, including a Safeway, Walgreens, Rite Aid, Post Office, Ace Hardware, and a great selection of eateries to choose from! Graham is also only about a 20-minute drive from Joint Base Lewis-McChord. Interested in learning more? Click here to view the full listing! You can also contact REALTOR® Linda Solheim-Diehl online here or give her a call/text at (253) 279-7665, or contact REALTOR® Erin Dobrinski online here or give her a call/text at (253) 380-7702. The country lifestyle awaits you with this dynamic horse property! 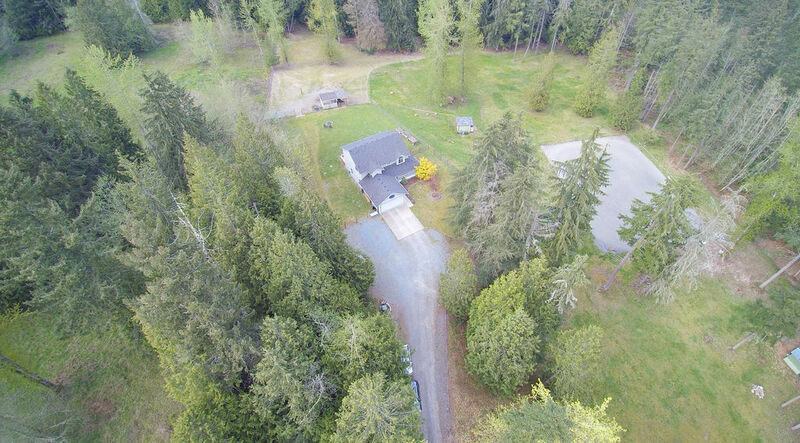 Sited on a fenced and scenic 1.94 acres, this unique opportunity is a dream come true for those who desire having tons of outdoor space to spread out on. In addition to the spacious 1,728-square-foot home, this incredible package also includes a 3-stall Uncle Howard’s Barn and a detached garage. 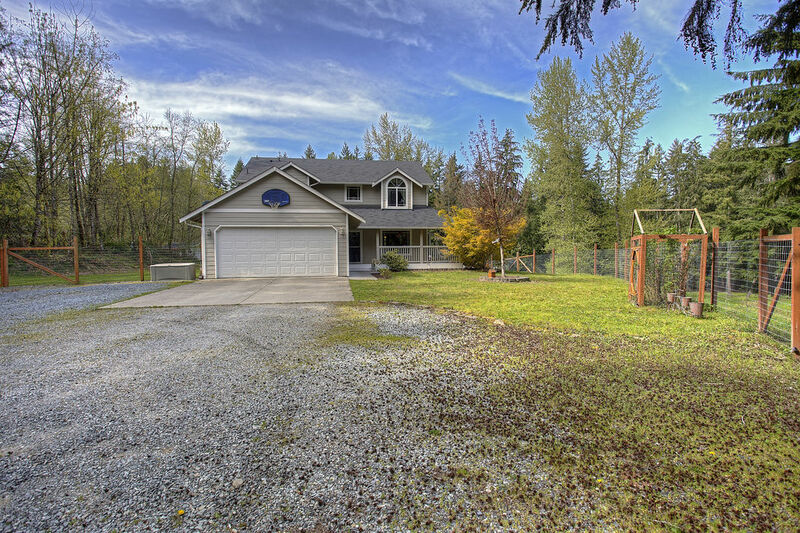 Located at 7803 304th St E Graham WA 98338 and close to Highway 7 and Highway 161, this residence is listed for $350,000. 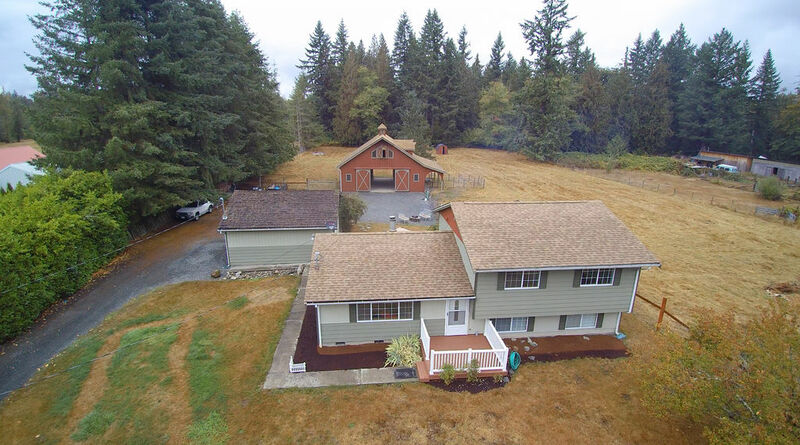 Surrounded by beautiful trees that show off the signature beauty of the Pacific Northwest, this expansive property offers sprawling pastures ideal for keeping horses or raising other livestock. A 3-stall Uncle Howard’s Barn offers quintessential style alongside excellent function—inside, find a tack room, feed and equipment storage, direct turn out, and a massive loft! A detached garage offers even more outdoor storage as well. In the home’s immediate backyard, a spacious deck and patio are ready for entertaining, all while offering a view of a gorgeous Koi pond. Step inside this welcoming 1,728-square-foot home to discover an inviting layout that includes 3 bedrooms, 1.5 baths, open-concept living spaces, and a huge lower level. On the main floor, the great room creates a sense of togetherness, all while having plenty of room to enjoy. 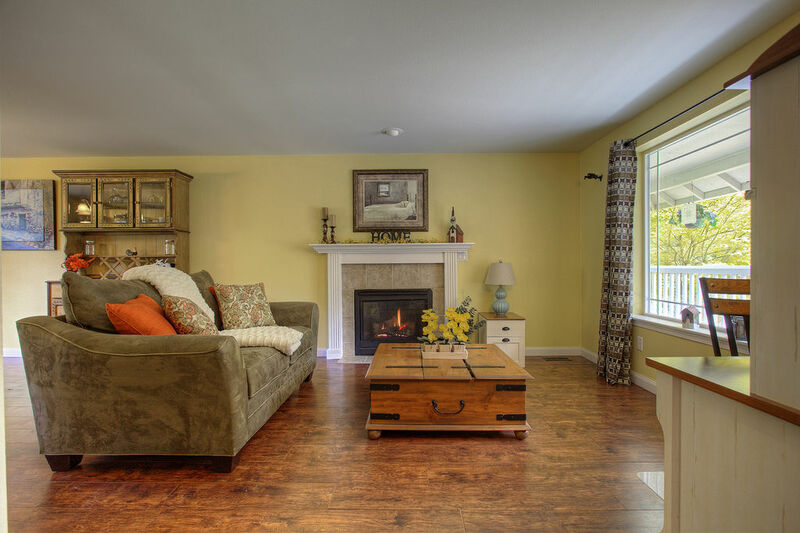 The living room even features a freestanding wood-stove, perfect for keeping the main level warm. Imagine snuggling up on the couch for a relaxing evening watching a movie or reading a book, all while the cabin-inspired stove keeps things cozy! 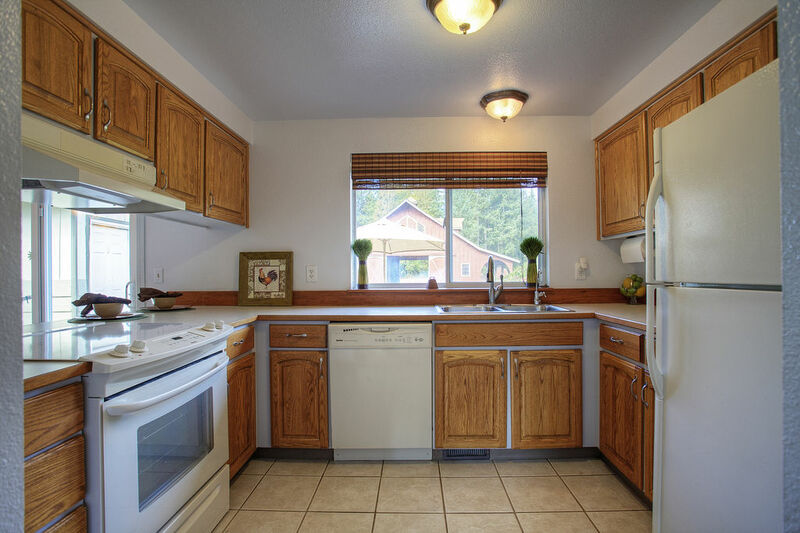 The layout flows right into the kitchen, a thoughtfully designed haven of convenience. Rich wood cabinetry ensures you have plenty of storage, and a large window offers a peaceful view of the picturesque scene that rests outside. The kitchen features an eat-in bar and looks out into the dining area, ensuring you have plenty of seating. Plus, sliding doors lead right out onto the patio, making it easy to dine al fresco or host weekend barbecues! 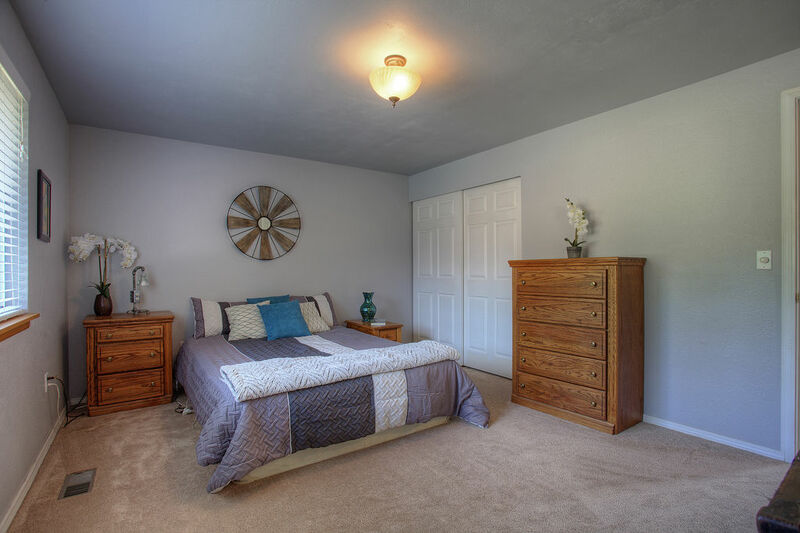 Journey upstairs to find 3 versatile bedrooms, all featuring comfy carpets and cool color palettes. Even more flexible space can be found on the expansive lower level, a dynamic space featuring newer carpet and a handy utility room. 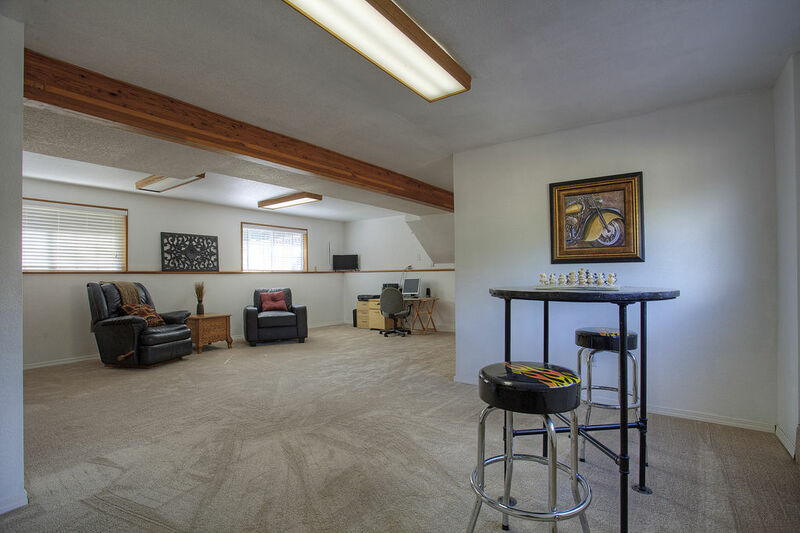 Whether you envision using this area as an entertainment center, recreation area, hobby space, or even as a guest suite, there is room for it all! At 7803 304th St E Graham WA 98338, you’re conveniently right in between Highway 7 (which becomes Pacific Ave in Spanaway) and Highway 161 (which becomes Meridian in Puyallup). Enjoy living in a rural atmosphere, all while having shopping, restaurants, services, and more just a short drive away! For those who like to get out fishing, hiking, or camping, you’re in luck—several lakes and beautiful outdoor scenes are close by, including Lake Kapowsin which is just a 7-minute drive away. Plus, Joint Base Lewis-McChord is just about a 15-minute drive away! Feast your eyes on this unique, completely one-of-a-kind country estate! 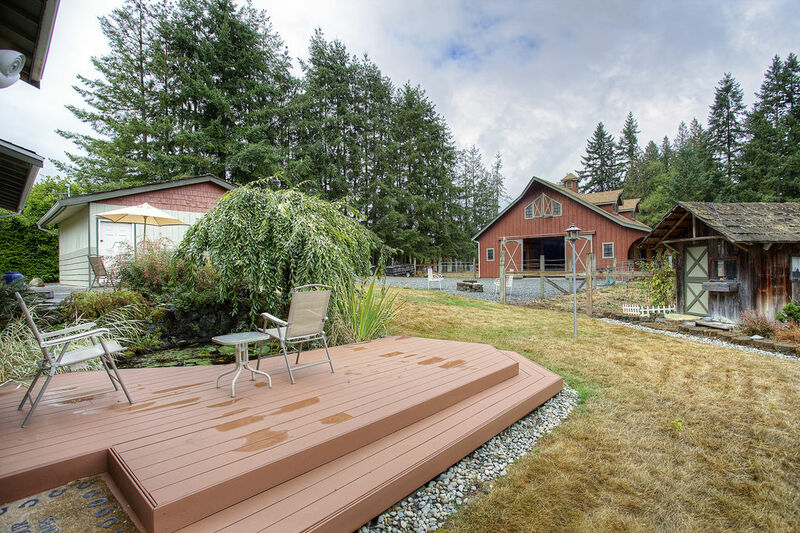 Located at 21207 127th Ave E, Graham WA 98338, this gorgeous 12.66-acre property is tucked away in the heart of the scenic Graham countryside, yet still wonderfully close to shopping, restaurants, and other nearby amenities. Featuring an updated 3,474-square-foot home (with 3 bedrooms + 3.25 baths), a 6-vehicle carport with RV parking, an outdoor arena, an incredible gazebo, a 2,800-square-foot shop/barn combo, and so much more, this masterpiece is listed for $699,000. For those who dream of raising animals and having plenty of outdoor space to roam and explore, this estate is absolutely paradise! Fully fenced and including 4 pastures, this expansive property offers a long list of amenities all while brimming with potential for you to make it your own. 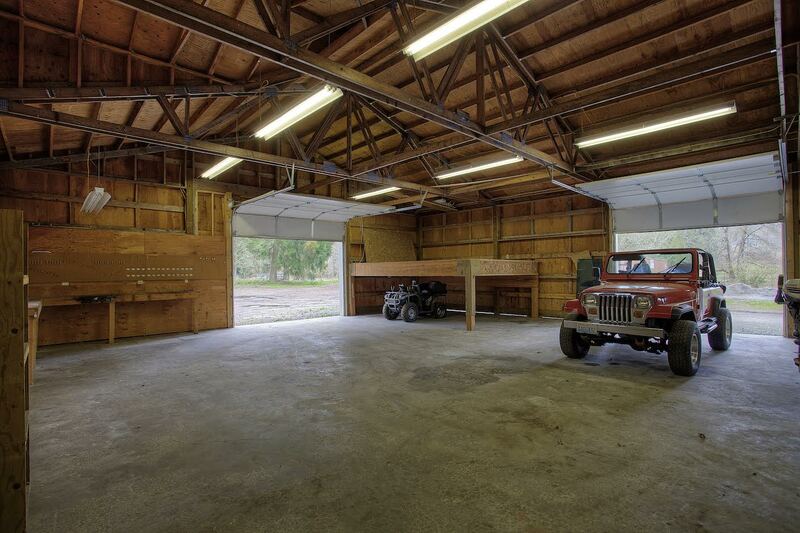 Discover a huge 2,800-square-foot shop/barn combo that includes three 12-foot roll-up doors, parking for 6+ vehicles, shelving, and massive amounts of storage and power. 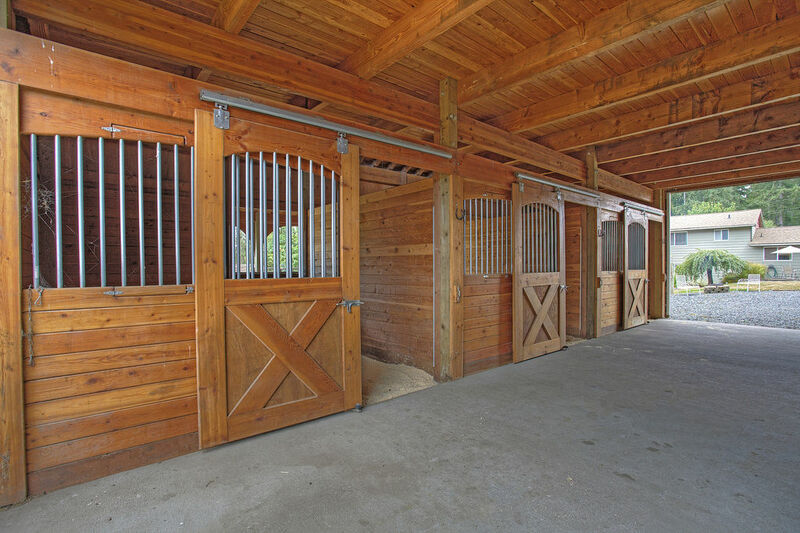 The barn area includes 2 matted stalls with graveled paddocks, hay/equipment storage and a tack room, plus power and water. For even more parking, there’s an attached 6-vehicle, 12-foot high carport, including space for covered RV parking with 30 amp service and even an RV sewer dump. Additionally, a 225’ x 87’ fenced outdoor arena with lighting offers even more space to take advantage of. But that’s not all—this estate offers function and beauty wrapped up in one dynamic package! Enjoy professional landscaping with a multi-zone sprinkler system, a fire pit area with stamped concrete (perfect for roasting marshmallows under the stars! ), and a patio with an electronic awning and wind sensor. An expansive 560-square-foot gazebo includes power and stamped concrete, offering the perfect space for hosting outdoor get-togethers (or even weddings!) rain or shine! Head inside this estate’s 3,474-square-foot home, and you can still enjoy the scenic outdoor view from almost every room! On the main floor, the palatial living room shows off soaring vaulted ceilings, a floor-to-ceiling brick-accented fireplace with a “Lopi” wood stove insert with blower, and of course, huge views of the scenic property beyond. The floorplan flows into the dining room and spacious kitchen, a beautiful, magazine-worthy space featuring attractive cherry cabinets, stainless steel appliances, elegant granite counters, tile floors, a garden window, and a large walk-in pantry with built-ins. The main level offers even more easy living with its convenient master suite, a dynamic haven that includes a walk-in closet, a 5-piece ensuite spa-inspired bath, and direct access to the outdoor patio. The bath features a jetted 2-man soaking tub and a huge walk-in shower with “jetted” double heads, plus new cabinets and new plumbing. 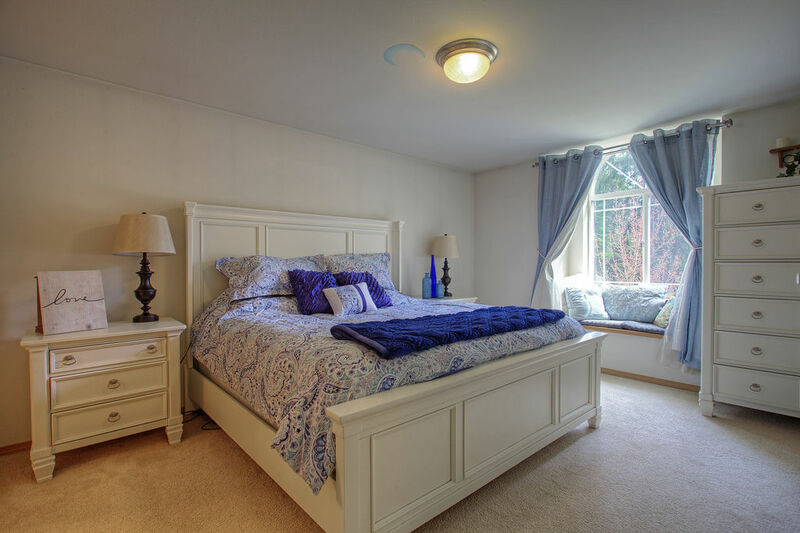 Find private guest quarters that provides handicap accessible amenities (like zero steps in the ¾ bath and handicap rails) and even its own kitchen, separate heat source, and ample storage! Additionally, on the second floor, 2 ensuites offer private baths and balconies—your guests won’t want to leave! Plus, this home includes a heat pump (propane/electric for A/C and heating), a water heater and water softener (both installed in 2014), a monitored fire alarm, and a tile roof. This incredible location offers the opportunity to enjoy the peaceful country life all while being close to city conveniences! From 21207 127th Ave E, Graham WA 98338, you’re just a 7-minute drive to Safeway, the feed store, great restaurants, the bank, a post office, pharmacies and more. Just 15 minutes away, you can find major shopping at places like Winco, Walmart, Kohl’s, Target, and much more. Plus, you’re just 10 minutes away from a great riding trail along the Puyallup River, making for a lovely, quiet adventure (with frequent eagle sightings!). Interested in learning more about this listing? Contact REALTOR® Erin Dobrinski online here or give her a call/text at (253) 380-7702, or contact REALTOR® Linda Solheim-Diehl online here or give her a call/text at (253) 279-7665.